A three-day meal plan can jumpstart your heart-healthy diet. This 1,500-calorie plan can help women maintain weight and smaller men lose weight. Breakfast: 2 large eggs, 2 slices whole grain bread, peanut butter. Lunch: 2 slices whole grain bread, 1 can tuna (packed in water), 1 slice low-fat mozzarella cheese, 1 Tbsp. olive oil mayo, 1 cup skim milk, 6 baby carrots, 1 Tbsp. light dressing. Dinner: 4 oz. grilled chicken, 1 cup sweet potato, 1 cup green beans, ½ Tbsp. olive oil spread, 1 medium apple, 1 cheese stick. Snacks: ½ cup fresh pineapple, ½ cup cottage cheese. 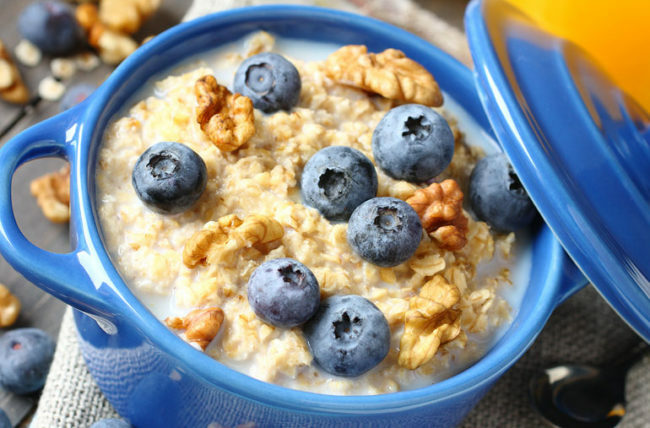 Breakfast: ½ cup oatmeal, ½ cup blueberries, 1/4 cup walnuts. Lunch: 2 slices whole grain bread, 2 oz. low-sodium turkey, 1 slice Swiss cheese, ¼ avocado, ½ Tbsp. light mayo, 1 cup skim milk. Dinner: 4 oz. salmon, 1 cup brown rice, 1 cup broccoli, 2 tsp. olive oil, 2 Tbsp. grated Parmesan cheese. Snacks: ¾ cup non-fat plain Greek yogurt, ½ cup strawberries. Breakfast: ½ cup fat-free cottage cheese, ½ cup pineapple, 1 hard-boiled egg. Lunch: ½ cup black beans, ½ cup bell pepper, 1/4 avocado, 2 Tbsp. tomato salsa, ½ cup shredded lettuce, ¼ cup reduced fat cheddar cheese, 1 low-carb wrap, 1 medium peach. Dinner: 3 turkey meatballs, 1 cup whole wheat pasta, ½ cup low-sodium marinara sauce, 2 Tbsp. Parmesan cheese, 2 cup spring lettuce mix, 1 Tbsp. olive oil, 1 Tbsp. balsamic vinegar. Snacks: 20 mixed nuts, 1 cup grapes. When you have high blood pressure, diabetes or excess weight, your doctor may refer you to a heart dietitian. 1.Distinguish nutrient-dense foods from empty-calorie foods. The Mediterranean diet is loaded with nutrient-dense foods, packed with vitamins, minerals, fiber and/or healthy fat; fresh produce; nuts, seeds and olive oil; beans and whole grains; and lean proteins. The typical American diet contains too many high-calorie foods devoid of nutrients: soda, chips, crackers, cookies and candy bars. They add to your weight, and raise your blood sugar and bad HDL cholesterol levels. 2. Choose healthy versus unhealthy fats. Healthy (unsaturated) fats don’t turn solid at room temperature, and include plant oils, nuts, olives, avocado and fatty fish. Saturated fats turn solid at room temperature. “While there’s room for some saturated fat in our diets, we want to limit meat and keep solid animal fat, like chicken skin, marbled cuts and bacon, to a minimum,” she says. Start replacing red meat with poultry or fish, and full-fat dairy with plant-based options like olive oil and nuts. Try making one meatless meal per week using beans or legumes. Manmade fats (trans fat/partially hydrogenated oils), also solid at room temperature, have been banned by the FDA. “They increase bad cholesterol and usually cause weight gain and inflammation,” she notes. 3. Tell healthy carbs from unhealthy carbs. High-fiber carbs (like whole grains and legumes) are always better than simple carbs, like sweets, snack foods, chips and white bread, pasta or rice. If you have diabetes and need to lose weight, limit your carbs to 2 to 3 grams per meal (for women) and 3 to 4 grams of carbs (for men). This will also keep your blood sugars stable. 4. Eat at home more often. Restaurant meals are often high in salt and saturated fat. If you’re eating out five days a week, “we’ll troubleshoot why you’re doing this so often and try to find some quick, easy options that you can make at home instead,” says Ms. Zumpano. Can’t give up eating at restaurants? Work on doing so four, or three, days a week instead. Avoid dishes that are fried, creamed, buttered or tempura, and opt for baked, boiled or broiled foods instead. 5. Get a handle on your snacking. Snacks should have no more than 15 or 20 grams of carbohydrate. (One carb serving is 15 carbs, two is 30, etc.). Include a protein and complex carb in each snack. Choose healthy snacks that suit your taste buds (e.g., replace sweets with fruit and nuts, and salty chips with whole grain crackers and cheese). 6. Reduce the salt in your diet. Always read food labels for sodium content, and if you have hypertension or prehypertension, limit yourself to 1,500 milligrams (about 2/3 teaspoon) of salt per day. When eating out, avoid the American Heart Association’s “salty six” (foods that increase blood pressure): pizza, poultry, deli meats, canned soups, breads and sandwiches. “We can show you how to make changes in the way you eat so that you can follow a heart-healthy diet and not even have to think about it,” says Ms. Zumpano. 1500 calorie meal plan heart-healthy meal plan.